As the weather changes and the temperature begins to cool, grief looms at the doorway. Sometimes he intrudes in every room of the house. Other times, he takes up residence somewhere visible, knowing he can be seen yet without making a scene. Very rarely, he spills out from every opening, demanding attention. Grief isn’t the enemy, but the enemy will use the pain of this burden to distract and cripple the believer. The enemy wants me to wallow in my grief and forget about the living. The enemy wants me to walk the path alone, broken and forever sad. The enemy tells me overcoming loss is an impossible task and I should give up. I do not listen to the enemy, nor do I walk the path alone. 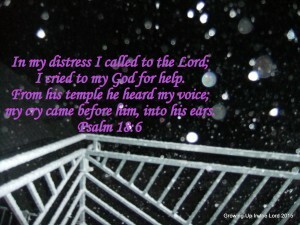 In the deepest cold of my sorrow, I cry out and pray to my heavenly Father. 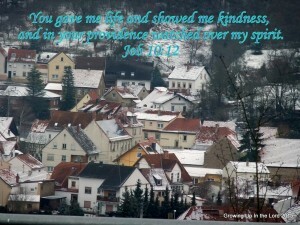 He provides comfort through His presence, through His Word, and through the people He places in my life. As the weather changes and temperature begins to cool, joy warms every room. It smells like pumpkin spice. My loss will always be a part of my story, my grief will be an unending circle, but the burden is lighter. The rough edges get smoother as the years pass though occasionally a splintered point will unexpectedly jab my heart. Though sometimes an hourly occurrence, I give my burden to the One strong enough to carry it. He heals me, yearly or daily or hourly – whenever I need Him. My grief is not too big for Him and He is able to carry me through. This post is part of the One Word Blog Linkup hosted by, Janine and Lisa! This week, the word prompt choices are COLD and PRAY. Post may contain affiliate links. All photos belong to the author and may not be re-used without permission. Fall seems like such a sad time of year, and I honestly don’t have anything particular to blame that on. My best guess is the lack of sunlight. I’d rather hibernate. Maybe I should have been a bear! Lack of sunlight can really mess with your emotions! I didn’t really think so until I lived in Germany… Being a bear would be nice… do you think the cubs pester the mama bear for 15th breakfast? Fall is my favorite season. One big event in my life that happened in the fall is NOT my favorite. Yet I trust in the Lord to use that experience and continue to work all things together for good, according to His purpose.